Massachusetts state legislators have passed the “Screen at 23” resolution, which encourages HCPs to screen Asian Americans for prediabetes and diabetes at a lower BMI threshold (23 kg/m2 instead of 25 kg/m2). The state governments in California and Hawaii have passed similar resolutions, and this recommendation is also part of the ADA Standards of Care. That said, having policy support behind this recommendation will be a major public health service. As this practice takes root among public and private HCPs in Massachusetts, 6,000 additional cases of type 2 diabetes and 20,000 additional cases of prediabetes could be diagnosed, allowing for earlier intervention and more preventative care. We had the opportunity to interview Joslin’s highly-regarded CSO Dr. George King. Joslin’s Asian American Diabetes Initiative (AADI) collaborated with other diabetes organizations to promote the national “Screen at 23” campaign. Dr. King highlighted the importance of culturally-appropriate health information and personalized patient care. He discussed plans to roll out this resolution in Massachusetts, with a focus on getting material into payer and medical society newsletters. Dr. King suggested that he’d like to engage pharmaceutical companies as well. An excited crowd gathered at the Grand Staircase of the Massachusetts State House yesterday to present the “Screen at 23” resolution, which encourages HCPs to screen Asian Americans for prediabetes and diabetes at a lower BMI threshold – 23 kg/m2 vs. 25 kg/m2 for other adults. Legislators from the Massachusetts State Senate and House have voted to pass this resolution as a result of the national "Screen at 23" campaign, led by Joslin Diabetes Center’s Asian American Diabetes Initiative (AADI) along with other diabetes organizations. Screening this particular patient population at 23 kg/m2 is already recommended by the ADA (this first appeared in the 2015 Standards of Care and it continues in the 2018 edition), but having policy support behind it will be a major public health service. As this practice takes root among public and private HCPs in Massachusetts, 6,000 additional cases of type 2 diabetes and 20,000 additional cases of prediabetes could be diagnosed, allowing for earlier intervention and more preventative care. Close Concerns alum Ms. Lisa Rotenstein attended the gathering live, where speakers noted that while everyone knows diabetes is an epidemic, it’s largely unrecognized in the Asian American Community. In Massachusetts alone, there are 460,000 Asian Americans; 50,000 have diabetes, but only 50% are diagnosed. “Screen at 23” could change the tide meaningfully. Speakers also emphasized the need for stronger education of Asian American individuals and their healthcare providers when it comes to identifying prediabetes and diabetes risk. The aim of this new resolution is to enhance awareness. In a notable appearance, ADA’s Chief Scientific, Medical, and Mission Officer Dr. Will Cefalu attended this announcement at the State House. It’s great to see ADA showing support for this sort of policy change – the potential for real-world impact for people with diabetes in the US is tremendous. 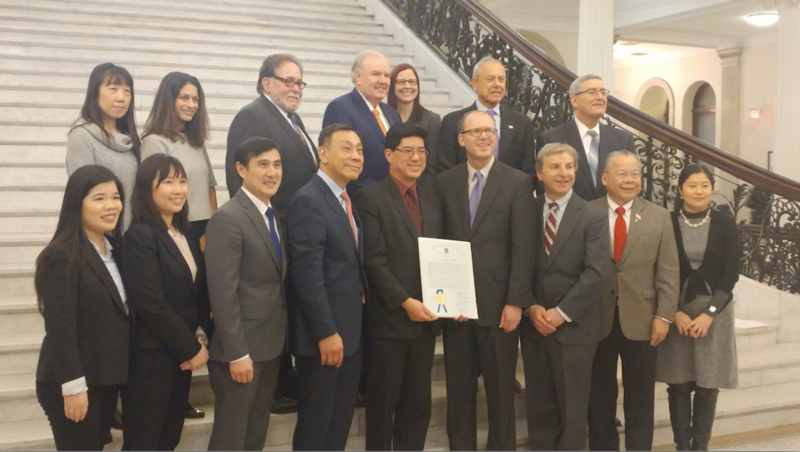 Massachusetts joins California and Hawaii in recognizing the 23 kg/m2 BMI cutoff for Asian Americans. Who will be next? This should be a component of best practice in all 50 states, and hopefully there will be near-term momentum to adopt similar resolutions in areas with high Asian American populations. How will PCPs be trained, how will their awareness grow? Joslin’s renowned Chief Scientific Officer Dr. George King was also present at the Thursday gathering, and our team later had the opportunity to interview him about the “Screen at 23” campaign. Dr. King shared that he’s been interested in this topic since the 1970s, when he noticed rising diabetes prevalence in the Asian American population at a BMI far below 25 kg/m2. The CDC, NIH, and other government organizations were reluctant to issue a recommendation without sufficient empirical data, and the national “Screen at 23” movement has worked to address that. Providing a little more backstory, Dr. King pointed to the efforts of Dr. Howard Koh, Assistant HHS Secretary during the Obama administration. Dr. Koh convinced the CDC to include Asian Americans in the NHANES study examining general population health in 2011. “Four years later, we had enough data to clearly show that diabetes is occurring at a lower BMI in Asian Americans,” Dr. King explained. He added that even though the “Screen at 23” recommendation was incorporated into the ADA’s 2015 Standards of Care, these statewide resolutions are crucial in spreading awareness. Now that the resolution has passed in Massachusetts, Joslin and partners are focused on getting “Screen at 23” information into newsletters from payers and medical societies. This approach will help target PCPs, which is important in catching undiagnosed prediabetes and diabetes. Dr. King suggested that he’d also like to engage pharmaceutical companies in this movement – the incentive is clear, since an additional 26,000 people diagnosed means more patients eligible for pharmacotherapy. He described the “Screen at 23” resolutions in California and Hawaii as good success stories so far. In California, there was already an Asian American network established to screen for Hepatitis B (which also runs at higher prevalence in this community), so public health leaders could piggyback off of that to encourage diabetes screening. Asian American public health initiatives were also pre-existing in Hawaii, according to Dr. King. There was less precedent to work with in Massachusetts, but we look forward to the changes that will take place over the coming months to make “Screen at 23” a component of regular practice. In terms of educating HCPs, Dr. King positioned “Screen at 23” as a piece of personalized medicine. He underscored that it all comes down to “treating every patient as an individual.” In his view, training medical students on lower BMI thresholds for diabetes in Asian Americans is valuable, but what’s even more important is establishing paradigms of personalized patient care. Even if medical students don’t remember that the mean BMI for Asian Americans with diabetes is lower, around 23 kg/m2, they should be prepared to conduct their clinical practice with a deep commitment to treating patients as individuals. Where will “Screen at 23” go next? Dr. King suggested that this movement will be most effective if it’s focused on the 10 states with 90%-95% of the Asian American population. Joslin continues to play an active part in this. Dr. King emphasized the importance of culturally-appropriate health information and education. While the NIH translates diabetes dietary recommendations into numerous Asian languages (and while this is an important service), Joslin’s website takes this one step further and features specific Asian food recipes for people with prediabetes or diabetes. Why do some people develop type 2 diabetes without obesity, and why do only 20% of people who have overweight develop diabetes? Dr. King expressed distinct curiosity around this question, from both a basic science and clinical perspective. There’s certainly more research to be done on how visceral fat and abdominal fat differentially affect beta cell function and diabetes risk. For real-world HCPs, patients in the lower BMI cohort can also be difficult to diagnose: Is this type 1 or type 2 diabetes? All the more reason that the “Screen at 23” campaign is important to generate greater awareness.